Stock market option trading is not the only securities market where options are actively traded but it is by far the most popular. You can also trade options on futures for other securities such as stock indexes, commodities and foreign currencies. Many people prefer the stock market because it is easier to understand, more information, training and courses are readily available and the concept of company shares is widely understood. Stock market option trading is about contracting the rights but not the obligations, to either buy or sell shares of company stocks. By investing a small amount of money for these rights, you get to benefit or otherwise, from the price action of the number of shares that the option contract covers. In countries like the USA and Australia, one option contract allows you control over the future price action of 100 shares. There are two types of options - calls and puts. Call options give you the right to "call" on the market to sell shares to you at an agreed price at any time up to an agreed expiration date. The idea is, that you own the rights to buy the shares at a price below the current market price. Put options work the opposite way - they give you the right to "put" shares to the market for an agreed price, usually called the "strike price". In this case, you want the strike price to be above the current market price so that you can sell shares for more than what they are currently worth. This, in its simplest form, is what stock market option trading is all about - making a profit from leveraging your funds to benefit from the price action of publicly listed company shares. But there is much more to it than that. You see, stock options can not only be purchased (called "going long") but you can also create an option contract out of nothing and sell it to the market - (called "going short") and receive a credit to your brokerage account for the sale. But the terms of "going short" calls and puts, is somewhat different to "going long". With call options, "short selling" gives someone else the right to "call" on you to sell them shares for an agreed price. To do this, you would have to either own the shares, or purchase them at the current trading price. Either way, if the current trading price is $40 and you have to sell them at $35, you lose $5 per share. The higher the trading price goes the more you lose, which means your losses are potentially unlimited. For this reason, brokers usually require a large amount of collateral to allow you to take a simple short option position. Buying, or going long options, is different. The most you can lose is the amount you put up. This is because you have the rights, rather than having given someone else the rights. Having established that you can both buy and sell (sometimes called "write") option contracts with different strike prices and a choice of expiration months, this is where stock market option trading gets interesting. There is almost no limit to the combinations of long, short, strike price, expiration date, number of each, positions that you can construct. 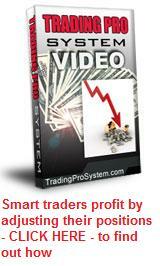 These are referred to as option trading strategies and sometimes option spread trading. Stock market option trading can also involve a combination of buying shares and selling call options related to them. The share premium received offsets any potential losses on the stock should the price fall and becomes an additional income stream over dividends. These are known as covered calls and are very popular. Finally, because of the high leverage involved in options, you can also adopt strategies which are non-directional. You don't care which way the underlying security price action moves, as long as it goes somewhere within a reasonably short time. There are some typical things you can observe in stock chart patterns which indicate impending price breakouts. The large profit you make on the winning trade engulfs the loss from the losing side and an overall profit is the result. These are called straddle options. 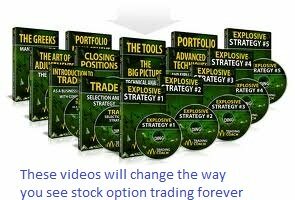 Learning stock market option trading can be an exciting and interesting adventure. Because options are much more flexible than other leveraged instruments, you can adopt strategies to suit your trading style. Once you understand the peculiar traits of options, you can use them to your advantage and stack the odds in your favour for that trading edge that leads to consistent income.